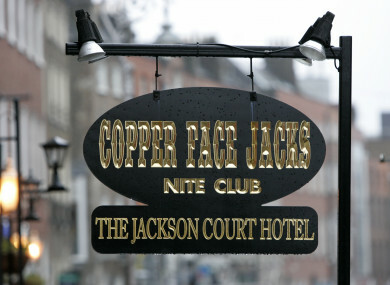 THE MILLIONS CONTINUED to roll in last year for the company behind the country’s best known night-club, Copper Face Jacks as accumulated profits at the firm soared to over €75 million. In another stellar year for the company that operates Copper Face Jacks on Dublin’s Harcourt Street, Breanagh Catering Ltd last year recorded pre-tax profits of €4.095m – or just over €78,000 per week. Boosted by yet another Dubs All Ireland senior football win in September of last year and a booming night-time scene in the capital, the cash mountain at the Coppers firm last year jumped by €3.93 million from €59.84m to an eye watering €63.78m. The business’s pre-tax profits last year declined by 20% from €5.16 million to €4.09 million and the chief factor behind the drop in profit was directors and joint owners, Cathal Jackson and Paula Jackson handing themselves a bumper pay rise. In the 12 months to the end of January 2018, the two shared pay of €1.28 million – or €24,775 per week for the two. The €1.28 million in pay represents a 63% or €497,688 pay rise – on the €790,568 paid out to the two in the prior year. The club housed in the Jackson Court Hotel on Dublin’s Harcourt Street has long since entered Dublin night-time folklore and has amassed the massive cash pile over the years as a result of its enduring popularity. The night-club opened in 1995 and a number of new entrants have entered the lucrative Dublin night-time scene in recent years. However, armed with its €63.78 million cash pile, the directors of Breanagh state that “the company is proactive in trying to stay ahead of competition”. The pre-tax profits at the firm decreased last year in spite of revenues increasing marginally from €9.41 million to €9.54 million – or €183,503 each week. The business’s fortunes were also boosted by unspecified ‘other operating income’ of €5 million. The firm’s profits decreased as the company’s administrative expenses increased from €7.47 million to €8.6 million. The €4 million in pre-tax profits of last year continue the run of very strong profits enjoyed over recent years – they follow annual pre-tax profits of €5.1 million, €5 million, €4.9 million and €5.5million in the preceding years. Last year, the company’s accumulated profits increased from €71.96 million to €75.46 million. Numbers employed at the venue decreased from 218 to 196 as staff costs, including directors’ pay, increased from €4.42 million to €5.14 million. The firm paid corporation tax of €595,620 and as a result enjoyed post tax profits of €3.49 million. At the end of January last, its tangible assets had a book value of €12.7 million. The increase in pub revenues is not just for Coppers, however. Pre-tax profits at the group which operates the storied Oliver St John Gogarty pub in Temple Bar last year more than doubled to €13.35 million. The jump in pre-tax profits at the Martin Keane-controlled Drayton House Holdings Ltd was largely as a result of a non-cash reversal of a property write-down of €7.37 million. Every year tens of thousands of tourists descend on the well-known Dublin pub, named after the Dublin literary figure immortalised in James Joyce’s Ulysses where he appeared as Buck Mulligan. The new figures for Drayton show that the pub’s success contributed to revenues increasing by 4% from €16.24 million to €16.89 million at the group in the 12 months to the end of 28 February 2018. The group also operates Blooms hotel in the Temple Bar area and the accounts show that the its cash pile jumped from €8.4 million to €12.19 million. Accumulated profits at the group increased from €34.87m to €46.86m. Numbers employed by the business increased from 108 to 114 with staff costs going up from €2.8 million to €3 million. Email “The owners of Coppers are sitting on over €75 million in profits”. Feedback on “The owners of Coppers are sitting on over €75 million in profits”.